Recent revelations about faulty evidence in two Texas death-penalty cases have raised new questions about the fairness of the death penalty. Now those questions will get an unprecedented hearing in the middle of a current murder trial: on Monday, a judge will hear evidence in the case of Texas v. Green that isn't about the crime in question at all, but instead about whether there's enough risk of wrongful execution in Texas to render the death penalty unconstitutional. The trial's defendant is John Edward Green Jr., who is charged with capital murder in the 2008 shooting death of a Houston woman who was gunned down in her driveway in front of her children. Prosecutors in Harris County, where the case is being tried, declined to comment about the case, but Williamson County district attorney John Bradley said the death penalty is still needed for "horrific crimes." This would certainly qualify. But Green's defense team, led by the Texas Defender Service, is taking advantage of an uncommon Texas procedure that allows judges to consider how a requested punishment (like the death penalty) is applied across the state, and consider that evidence as part of a trial. It's a new forum for old wars about the constitutionality of the death penalty: those battles are usually fought in appeals court, not during the first trial itself. "This is completely unique," says David Dow, a University of Houston law professor who also works with the Texas Defender Service. "It's never happened before in Texas. That alone makes it important." Two executions recently re-examined by the Innocence Project and others have likely inspired this hearing. Cameron Todd Willingham was executed in 2004 for setting a fire that killed his children; the arson testimony that led to his conviction has since been widely discredited. The 1990 conviction of Claude Jones was recently called into doubt, in a case that was first reported nationally in TIME, when a new DNA test found that the prosecution's key evidence  a piece of hair  belonged, in fact, to the victim, and not Jones. The Innocence Project and one of its co-founders, Barry Scheck, have long argued that the DNA exonerations they've worked on reveal other prosecutorial flaws that contribute to wrongful convictions. In 75% of DNA exonerations nationwide, they say, one or more eyewitnesses made false identifications. False confessions factored into a quarter of DNA exonerations, by their count, and unreliable informants and jailhouse snitches were a factor in half. They also point to numerous crime-lab scandals and racial discrimination in jury selection. There is a reason 139 people have been exonerated from death row since 1976, says Scheck: the death penalty is simply not fair. The judge in the case would seem to be unusually sympathetic to those arguments. State judges have to run for office in Texas, where taking a public stand against the death penalty can be a huge political risk. But Judge Kevin Fine, a Democrat from Harris County, which leads the nation in executions, already ruled in response to a motion from Green's defense team earlier this year that the death penalty was unconstitutional because it lacked safeguards against wrongful conviction. "It takes a rare trial judge to do that," says Dow. "The truth is that even most Democratic judges would have dug a very deep foxhole and hid in the bottom of it to avoid confronting these issues." Fine later rescinded the ruling, deciding instead to set Monday's hearing, which will give prosecutors an opportunity to present their own evidence in response. That's a fight that prosecutors like Bradley are happy to take on. "Legally I can't imagine another government system that has more reviews and procedural protections than the death penalty," he says. "There are so many types of investigations and representations and reviews afterward." Even if Fine does rule against the death penalty, it's unclear what the long-term effect will be. Dow points out that it will be an important symbol, but unlike a ruling from a higher court, it won't change the way other judges have to rule. Fine could rule the death penalty unconstitutional in the morning, he says, and in the same courtroom, another judge could sentence someone to death that afternoon. Professor James Liebman of Columbia Law School believes a ruling could have a deeper impact. Judges could choose to cite it in their own decisions later on if they wish, and there could be wider political fallout as well. The Illinois legislature, for example, is locked in another battle about what to do with the death penalty. 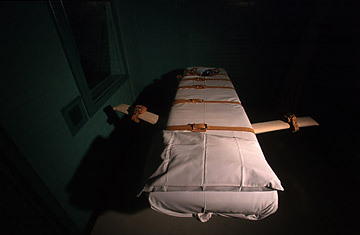 Seeing a strong anti-death-penalty ruling from the capital-punishment capital of the U.S. could convince fence-sitters. It could, he says, "cast a cloud over the whole debate."